Please email me at leandrawallaceatgmaildotcom to let me know where to send it. Congrats, Katie! 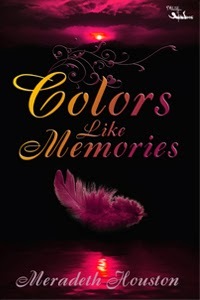 COLORS LIKE MEMORIES Paperback Release Par-tay(plus TWO giveaways)!!! I've a special guest today, author Meradeth Houston. Take it away, Meradeth! Julia has a secret: she killed the guy she loved. It was an accident- sort of. Julia is a Sary, the soul of a child who died before taking her first breath. Without this 'breath of life' she and others like her must help those on the verge of suicide. It's a job Julia used to enjoy, until the accident that claimed her boyfriend's life- an accident she knows was her fault. If living with the guilt weren't enough, she's now assigned to help a girl dealing with the loss of her mother, something Julia's not exactly the best role model for. If she can't figure out a way to help her, Julia's going to lose her position in the Sary, something she swore to her boyfriend would never happen. Those are my three things, and if that's not enough to interest you, well, I've also got a little giveaway running for a book of your choice. Check out the rafflecopter below. > She's a Northern California girl, but now lives and teaches anthropology in Montana. > When she's not writing, she's sequencing dead people's DNA. For fun! > She's been writing since she was 11 years old. It's her hobby, her passion, and she's so happy to get to share her work! > If she could have a super-power, it would totally be flying. Which is a little strange, because she's terrified of heights. Also, Meradeth has answered some questions I asked just for fun! What would do you misspell most often when writing? If you were cursed by an evil witch/wizard/genie to read in only one genre the rest of your life(i.e. romance, dystopian, thriller, sci-fi, etc.) what would it be? Would this mean I wouldn't ever have to read boring textbooks again? I may be looking for silver-linings here. :) I think I'd go with paranormals- I love a good vampire/shifter/angel real-world-with-a-twist book. What is your fav beverage and/or snack to consume when you're reading/writing? Hot chocolate. The real stuff. I'm addicted. Totally and utterly so. I'm pretty partial to the slightly spicy, thick hot chocolate that I make from time to time- it rocks! Pretty bookmarks or straw wrappers to mark your spot in a book? And last but not least, if a good witch/wizard/genie granted only one of your fictional characters to come to life so that you could spend one hour w/them, who would you pick? I'll keep the giveaway open from Fri(9/27/13) thru Sat(9/28/13), for those who follow by email and might not get notification of a new post until the following day. And, too, b/c if you're like me, you squeeze in time for social media where you can, meaning not always on the same day something was posted. 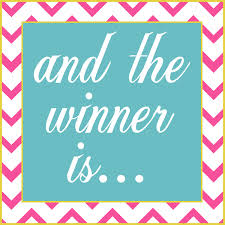 And don't forget to enter through the Rafflecopter above for a chance to win a FREE book. So thanks to Meradeth for stopping by and congrats on the paperback release! Have a great weekend everyone! 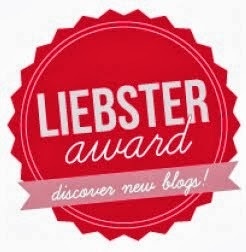 So the very cool Jazmen from This Girl Reads Alot nominated me for the Liebster Award. It's a way to help out bloggers with less than 200 followers who could use some more of you awesome people! *blows kisses... it seems appropriate since liebster is German for sweetheart* =) Below are the questions I was asked, and my answers. I started blogging as I felt like I had super important things to say that people needed to hear... Completely kidding! No, I started blogging b/c I enjoyed reading blogs that dealt w/books and writing and thought it'd be a fun thing to do myself. And it is! Beauty, Chains, The Scorpio Races, The Raven Boys Cycle, The Hunger Games, Harry Potter, The Knife of Never Letting Go, The Abhorsen Trilogy and many many mooore! 3. Favorite book quote and why? 4.What is the one thing besides books you cannot live without? Air? Water? Oh...not so literally? 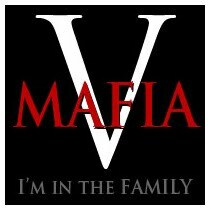 =) That would be family. Lets see. Keturah and Lord Death by Martine Leavitt, The Caged Graves by Dianne Salerni, and Sweetly by Jackson Pearce. Yikes! This one is hard b/c I love food and I love variety. Um... probably anything I can eat w/some sort of dip. Cheese, marinara, ranch, salsa, etc. 7. Favortie time and place to read? I can read anytime of day, but my fav place is in the car- preferably after I've just went through a drive-thru. Food, pop, and a book in hand- yes, please! 8. If you could switch places with one fictional character, who would it be and why? Since some of the main characters in my fav books go through some really bad stuff(I don't want to fight to the death w/ my peers, have an evil wizard out to get me, or have water horses try and eat me) this is a hard one. So I strolled in to look at my bookcases and decided on Slyvia from the Dinotopia books b/c, you know, she got to grow up w/dinosaurs. 9. One book you wish you could go back in time and unread? 10. Favorite book related website and why? Definitely Goodreads! I love friending other people w/similar interests, the groups you can join, the monthly newsletters, the quotes, and the book advertisements that sometimes lead me to books I might not otherwise notice. Once a month I'll be posting a dessert recipe and an excerpt(s) from a book thats struck me just right, whether it be gorgeous descriptions, funny dialogue, swoon-worthy kisses, sarcastic come-backs, or spine-tingling encounters. The boys rolled past them. Tufts of fairy hair, ripped out by the roots, drifted into the orchestra pit. Tiny scraps of clothing exited the brawling tumbleweed at sporadic intervals: a sleeve, a sock, a pointy-toed shoe. "I'll beat you for a living!" "Now way!" yelled Mustardseed. "Who knows what's out there?" "I bet I get eaten by a grue-" Moth paused, choking on his own spit and cowardice, then finished, "-a gruesome monster of indeterminate size and shape. I'm pretty sure I taste like chicken." "You're bioluminescent," Bertie said. "Which means you taste awful. Now, come on." "Hey, Mustardseed took a bag of jelly beans!" Cobweb whined, far less concerned about access to the stage than stolen snacks. "You can have the black one." "But I wanted the red one!" A muffled noise, then, "Now it's up my nose. 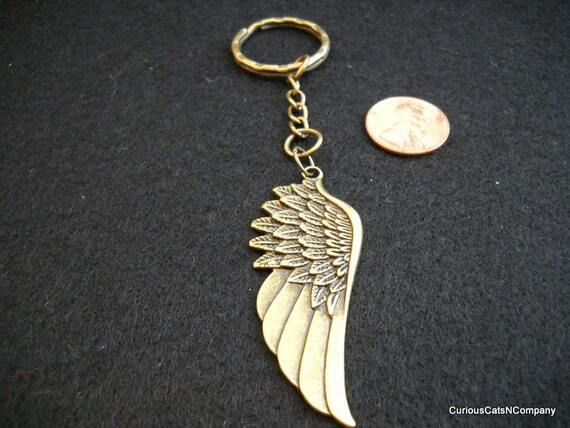 Still want it?" followed by a very sulky "No!" "That's why I don't eat the green ones." Bertie turned another corner only to collide with Ariel. Ariel, btw, is a very swoon-worthy air elemental...*waggles eyebrows* If you enjoy plays and the theater, then Mantchev's series is a must read. And even if you don't, the characters and the imaginative colorful world that awaits in this series is bound to draw you in. As for this month's recipe, I picked it in part b/c it's yummy and in part b/c it sounded like something the fairies would only be too willing to dive into(literally). 1. In a microwave proof mixing bowl combine cake mix and powdered sugar. Stir just to blend. 2. Add in butter and milk. No need to stir. 3. Microwave on high for 2 mins. 4. Immediately remove from microwave and carefully stir to combine. Once blended, add in white chocolate chips and blend again. 5. Fold in about half of your sprinkles to give some color. 6. Quickly spread fudge into a 8x8 greased pan. Add remaining sprinkles to top and gently press down to secure sprinkles. Refrigerate until completely chilled, then cut into 1 in. squares. 1. As much as I love painted furniture-- I don't like painting it. It's a pain. And at this point I don't really care how my yellow desk turns out. It's yellow. That's all that matters. And has cute knobs, darn it. 2. Diet is a dirty word. 3. Due to my critique partner's book, the phrase 'the lady in blue' keeps popping into my head(Grunge Gods & Graveyards will be published in the spring from Red Adept Publishing.) And if such a great title has you curious about Kimberly, she can be found here: http://kimberlyggiarratano.com/ and here as well: https://www.facebook.com/KGGiarratanoAuthor?ref=profile. Anyway, the 'lady in blue' is making me want to break out the drawing pencils-- something I haven't done in eons. 4. Desk, I will not give you three coats-- I refuse! Can I get remarried? Just so I can plan a book-themed wedding? There are some super creative ideas out there for word nerds who are about to tie the knot, so I thought I'd share some of my favorites. Can't you just imagine getting married in front of this? Love these for centerpieces. 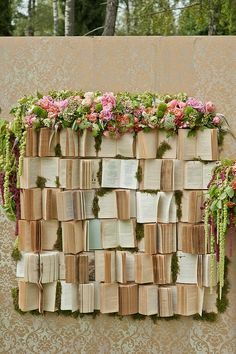 Vintage books in whatever color you need w/bouquets on top. Another pretty bouquet, this one for the bride! These would look adorable as boutonnieres, maybe with a single leaf of greenery off to one side. Love this idea for the reception! Music, laughter, and...the click-clack of a typewriter. And what better way for people to find their table-- an old card catalog! And last but not least, this would have to go somewhere. Me thinks maybe at the bridal party table, in the middle of a row of vintage books tied w/twine and w/flowers at either end. Lovely!